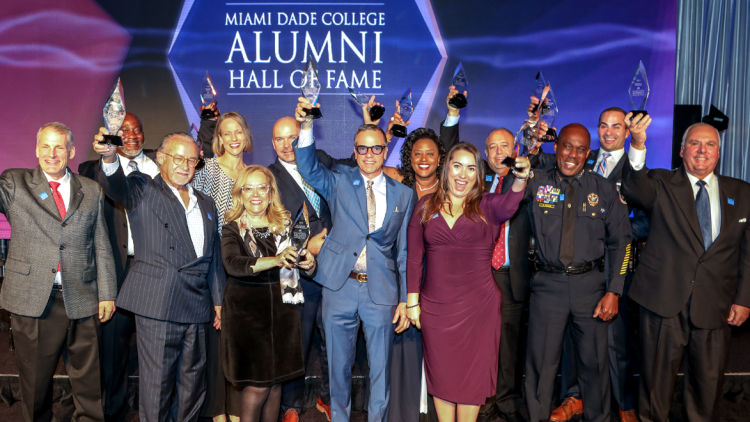 For the third straight year, Miami Dade College Foundation raised more than $1 million at its sold out 2019 Alumni Hall of Fame Induction Ceremony on Tuesday, April 9th. More than 1,000 guests attended the celebration at the Hilton Miami Downtown and nearly 90 corporations and individuals sponsored the event. The event raised a total of $1,051,395, which will support scholarships for current and future MDC students. Top corporate sponsors included Follett, OHL-Bldg, BankMobile, City National Bank, Lennar Foundation, Leon Medical Centers, and Norwegian Cruise Line Holdings Ltd. The full sponsor list and additional information can be found at www.mdc.edu/halloffame. During the event, 13 MDC alumni were inducted into the Alumni Hall of Fame for making a positive impact in their fields, the College and their community. The 2019 inductees are leading in a variety of industries, from business to education, journalism and public safety. In total, MDC has inducted 376 alumni to the Hall of Fame since the program was created in 2003. MDC Foundation Board Chair Julie Grimes and Vice Chair Al Salas also paid tribute to outgoing MDC’s President Dr. Eduardo J. Padrón for his vision and commitment to providing educational opportunity, presenting him with the MDC Alumni Hall of Fame Founder Award. Dr. Padrón, who is also an MDC alumnus, created the Hall of Fame event during his presidency. This August, he is stepping down from his post after nearly 25 years as College President and 50 years of service at the College.